Restore Your Oral Health With Dental Implants in West Palm Beach! It goes without saying that losing even just one tooth can affect the appearance of your smile, as well as your self-confidence. But you may not realize how it impacts your oral health in other ways! Every tooth works together to help you speak with ease and chew a variety of foods in a healthy diet. In addition, a full complement of teeth gives your face structure and support, so missing teeth can affect the overall aesthetics of your face as well. Unfortunately, all of these unanticipated consequences come together to really impact your overall quality of life. The good news is that modern dentistry has a solution that looks and feels so natural that you might forget you ever lost teeth to begin with: dental implants in West Palm Beach. Learn more about how implants work and why they’re such a wonderful replacement option in this blog! Why Are Implants Such a Fantastic Choice? 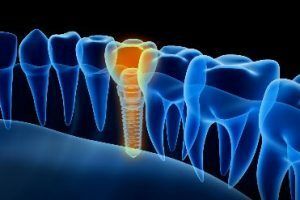 Implants offer one crucial advantage that other replacement options don’t: they replace the root of your missing tooth. This tricks your body into thinking that it never lost a tooth, so your facial structure will stay the same and your jaw won’t shrink. This replacement root is also what gives you unparalleled support and chewing strength that you simply wouldn’t get from a traditional bridge or denture. The stability is what makes an implant look and feel like your own teeth! During the first phase, a surgical-grade titanium post is placed in the jaw. Rest assured, this is much easier and more comfortable than patients expect and usually takes 1-2 hours. Next, the post is given 3-6 months to heal, or fuse, with the jawbone, during which you can eat, drink and function normally. The second phase involves attaching a crown, bridge or denture to the implant to fully restore your missing tooth (or teeth). This part of the restoration will be precisely matched to the rest of your smile so that it looks very natural. Also, another advantage of implants is that they can last decades, or even a lifetime, with basic care and maintenance (i.e. good hygiene at home and routine checkups). Losing even just one tooth can have far-reaching effects on your life. But West Palm Beach dental implants can completely restore your oral health so you can lead a full life with confidence. The only regret most patients have is that they didn’t get implants sooner! For any patient who has lost their teeth, Dr. Mihran Asinmaz loves that he can restore not only their smile, but their overall health and self-confidence as well. He’s seen firsthand the difference that dental implants make in his patient’s lives and is happy he can offer them such an outstanding solution. If you have any questions, he can be reached via his website or at (561) 640-9200.